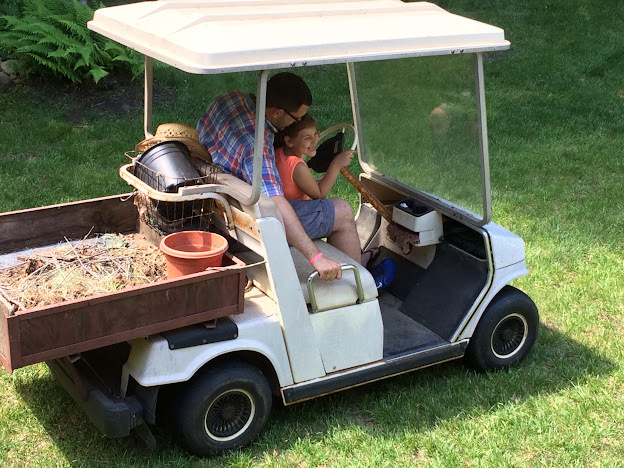 Whenever my youngest granddaughter comes to visit, I ask her if she wants me to pick her up at the bottom of the gravel road with the golf cart. She has never declined the offer. When my son and DIL arrive, I watch her anxiously undo her seatbelt and climb out of her car seat. Then she climbs into the cart and says "Let's go, Nana." Chatting about what she's been up to as we scoot up the hill in the cart, I make her wait until I back into the garage before she climbs out and rushes over to the fence to see Moon and Copper. It's become a tradition. On a recent visit, while the Pres and I enjoyed our DIL's company, this is what we saw occasionally flying by....and I mean flying! She seems to get as much joy out of driving my MIL's old cart as I do! i really like your trucker cart and she looks so happy and adorable..
Oh how wonderful and a new tradition in the making. Thanks for sharing. These are certainly handy for work and for fun!